Living abroad allows for many opportunities for growth and change. I imagine all cultures have things about them that you cringe at, maybe food, and then there are some things that look like something you could learn. Mexican culture, especially here in Guadalajara, is quite different from my own home country. Now I also realize that I am speaking from my own experience. Not ALL Mexican's hold to the same experience nor do ALL Canadians. So I am speaking from my own experience. I have found that Mexico loves music and dance. At almost all gatherings that I have attended over the years, both here and in Chihuahua, music was played. I would add here that this is not quiet background music but load festive music. Many times there is a Mariachi, which goes without saying, that it is loud. Dancing is also very common at parties, at birthdays, at weddings, etc. They love to dance. And I would say that many dance, and dance well. Our friends love it if we know a song or if we can request a song for the Mariachi to play. Sometimes they are amazed when I mouth the words to a song. To which I reply, "most mariachi play the same play list...I'm learning." Music was easier than the dancing thing, two left feet! So Ernie and I took dancing lessons for several months and now can join our friends on the dance floor Salsa is a little tricky for dancers, but we had a great teacher and can now survive! They are excited when we join them on the dance floor. So, some things we take from the culture, and then there are some things we try to add. We have noticed that at most Mexican parties, or events, are mostly sitting around tables, trying to visit over the loud music, eating, and most of the rest are drinking. We have introduced doing a few things differently. At both my birthday and Ernie's we changed it up. People DID stuff. Most people said they enjoyed our parties cause they are so different. 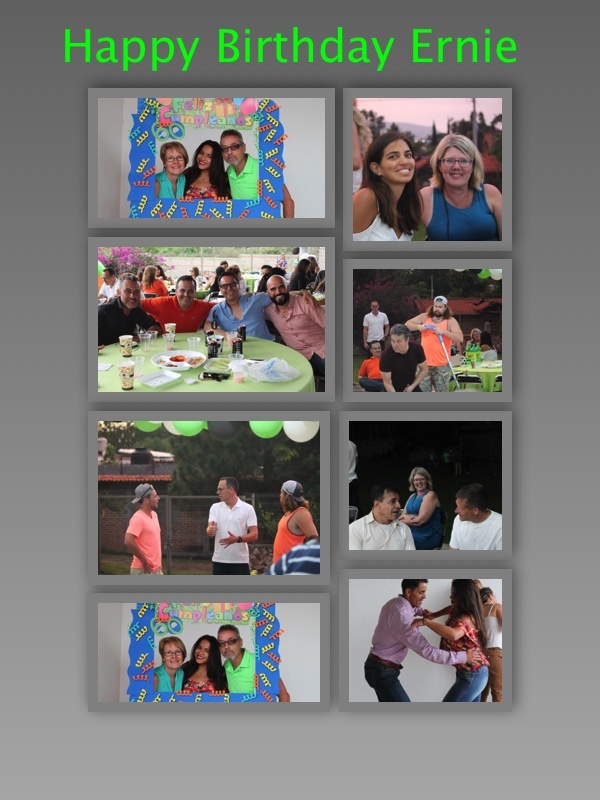 This weekend we were at a birthday party. Before leaving Ernie threw a yard game into the car. We were at a lovely terraza with a large green space. It was a very relaxed atmosphere so he decided to haul out the game. It was enjoyed by the men throughout the day and many asked for instructions on how to make one. Ernie made friends with several men over the Ladder Golf game. They enjoyed having something to do. We had long since introduced floor hockey and if the sticks are out they are put to use! It becomes about sharing one's culture (or family traditions) with others. My family gatherings are always done with some kind of table game or activity. Might be because of the over active kinds of people in my family? Ernie hates to just sit around. He has learned to dance, so if he must he does, but while I was dancing with the ladies, the guys were playing Ladder Golf. The point is to see the good in the other's culture, to look for ways to bridge the gap. I learn from them and they learn for me. Mutually beneficial. When you look at that your reaction might be, "why would I want to leave that place"?Why would you want to leave the place where you feel safe and without stress? It's counterintuitive. Yet apparently life begins just beyond it! 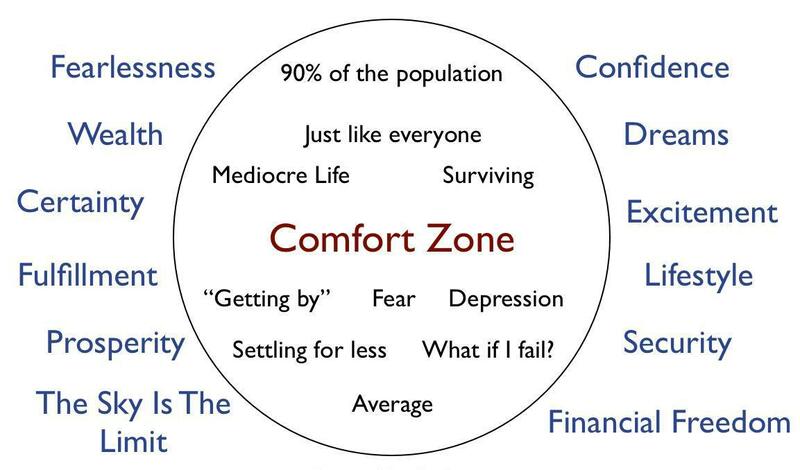 This circle implies that the comfort zone is not a good place. One can apparently only find a mediocre life there. Everything is outside of it. Now I will be one of the first to say that the whole "what if i fail" thought is quite strong, while sitting inside one's comfort zone, because we fear failing. 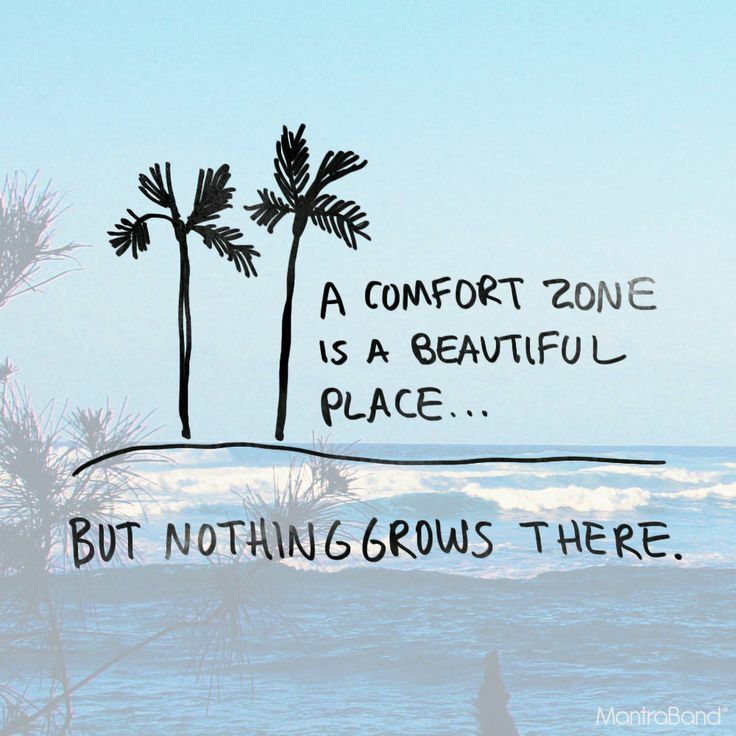 They also say that nothing grows in one's comfort zone, although admittedly a beautiful place. Well, I can't speak for everybody but I can share my own life experience. My comfort zone was a happy place, beautiful even. Living 2 blocks from my parents, kids close by, church family, friends, job, etc. A nice safe place, although not without stress. I don't know if life is ever stress free. But I do know it is a lot easier than stepping outside those 'walls'. Moving to Mexico could be viewed as leaving one's comfort zone because it is definitely not the same as staying in 'the circle'. Yes, moving across the country from family, friends, church, and my kids, was scary, and not SAFE. It has been a time of growth for me. That said, one can easily create a safe, comfort zone kind of lifestyle abroad as well. It is, I believe, a natural instinct, and a normal part of 'adjusting'. But alas, that has not been my experience. We have done things outside of our comfort zone regularly. Our friends are very different here than we had back in our little comfort zone in Canada. We had a very rural mentality to life. What is open to do on the average evening? What times does one head home from an event? Well, let's just say that my schedule is all berserk here! Things START here at 8 p.m. And, if you actually arrive at 8, you will be one of the first people there. We often leave early - 1 a.m. - 2 a.m. I am always doing things outside of my comfort zone. I have found that there is a lot of growth that happens there, a lot of stretching. If I look at who I am right now, I am quite different; I have been adapting. I daily, sometimes fearfully, leave that safe zone and try. I am trying to follow Paul's example of being all things to all people "for the sake of the gospel" (I Corinthians 9:19-23). I think in doing this one has to know who they are in Christ, what they can and can not do, and not lose sight of the reason for which they are 'crossing the room'. No matter how we try to adapt we are still clearly distinct. We stand out and apart. And that's the way it should be! They accept us, and love us, but we are a 'different animal'. Our goal is to make them feel and see the love of Christ through us. It is a daunting task but one we feel God calls all of His children to. Here is a picture from the weekend. On Saturday night we headed out at 11 p.m. to meet friends and celebrate a birthday. They wanted to go dancing. Obviously a place where people drink and dance can be quite a bit outside of our normal experience - to say the least! However, can I really expect them to cross into my environment unless I'm willing to love them where they are at? One of the greatest criticisms Jesus received was that he ate with 'publicans and sinners'. He crossed the room, joined in their feasts, loved them as they were. So too we must 'cross the room', love them even before they have 'accepted' or 'changed'. So we laughed and enjoyed ourselves in an environment way outside of our comfort zone. We got home at just before 3 a.m.! We are aware that we are being watched, evaluated, and that our testimony is important. 'Crossing the room' doesn't mean participating in everything - there are limitations. But we can be a presence, we can be salt and light - where it is most needed! We had a weekend to remember with some of the folks from our Wednesday cell group. Porfirio (blue shirt) is from Acaponeta, so we were in his environment. Although his wife, (sitting next to him) is from a small town a short drive from there. People that are from the coast are very different than those from the big cities. They eat differently, are used to a very distinct climate, and have a different pace to life. Watching them there was to see the 'real' them. People also love to share their lives with you and they love to see you enjoy it. So, the first thing I noticed was the food. I grew up living the farthest one could live from the ocean, east to west. Manitoba is in the middle of Canada, east to west. What we've got is lakes, which is nothing like the ocean! I also say that, due to where I grew up, I have never been a big seafood person, and even less when it's raw! We arrived to unpack and head over to the local restaurant for our first taste of local cuisine. This particular meal (pictured) was VERY good, although, due to the hour, they apparently did not have the 'good' fish. I said that if this was the not so good one...imagine the good one! It was called pescado zarandeado. It was very good; it was the pre stuff that was a little unusual. 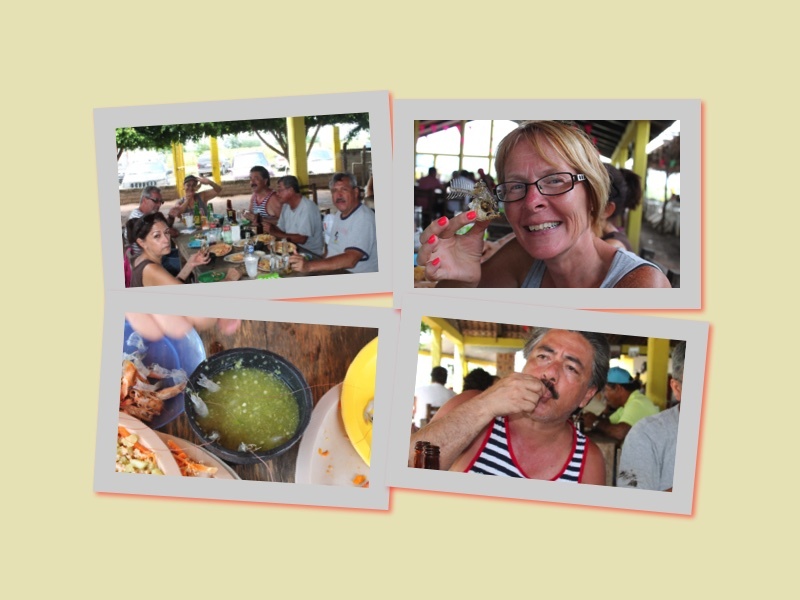 The one in the forefront, which was served several times was ceviche -raw or 'cooked' in lemon. It is shrimp, bathed in lime juice, with red onions, and cucumbers. I could eat it without difficulty, Ernie not so much. The plate in the back was also shrimp but it was boiled for EXACTLY 3 minutes. That was very tasty, and preferred by Ernie. Then the 3rd plate was shrimp al ajo (garlic shrimp). Also tasty. So, while we are on the topic of food...after our morning of fishing (pictures to follow) we went to what is referred to as a "Botanero" (snacks) restaurant. Here they charge you for your beverage and the snacks are 'free'. Meaning, they charge you more for your beverage, hoping you drink lots and that will cover the snacks. The snacks are all seafood. Once again the ceviche, plus Marlin (my personal favourite), fried fish, straight up raw shrimp (no preparation at all), etc. It was interesting. The bowl with the green hot sauce is raw shrimp! I am showing the finished fried fish I ate. Rather the skeleton! The next thing that I have started to struggle with is the heat! Guadalajara is relatively moderate in climate, not hot or cold. I now understand why Canadians go to Vallarta (the beach) in winter and not in summer. Summer heat is a heat which is 'sin palabras' (without words). Add rain to that temperature, which means humidity, and NO AIR CONDITIONER! WOW! I have always been a person who hates the cold but heat now has my respect! Not that I am fussy or anything! I just want the temperate to be reasonable! (hahahaha) But, I did not go for the weather, but the company. So, other than eat...we went fishing. Interesting that. 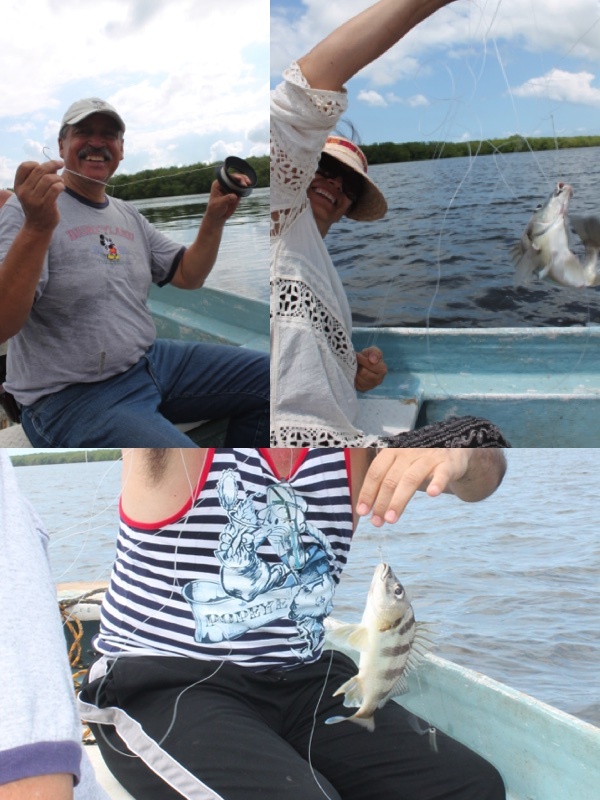 We did not go deep sea fishing, but rather on a river (salt water inland). Nothing like I have done with my sons at the lake. The way we fished was new for me, the boat was nothing like my sons' boat, and then the fish. The fish we caught made noises like a pig! Seriously! We plan to eat them next week so I don't know yet what they taste like. Fishing in the heat and humidity was one thing... then came the mosquitos! What a morning! So we ate, we fished, we enjoyed the ocean, we tried to cool off in a tepid pool, and we visited. It was a great weekend, but a tiring one. You see, I need to say that it is hard to sleep in the heat without air conditioning, but when the electricity fails (due to an incredible thunderstorm), and there are no more fans, well, needless to say, sleep is imposible! All things considered we had a great weekend with our friends. We ate well, we enjoyed God's handiwork (with some incredible scenery) and His majesty in the thunderstorm, and we enjoy each other's company. Life is rich when lived in community. SURPRISE! SURPRISE! I so wanted to share with all of you about the our children coming as a surprise for Ernie...but alas, it was to be a surprise. It was so much fun for the kids to come, and as a surprise. They had been planing this since early March...so the risk was great, as to whether he would find out. Added to this, the amount of people that DID know. But, no one let the cat out of the bag, and then there was the phone call telling him that they just couldn't come, due to work. Fun! Things got rolling on the 18th, when our friend Marilyn Kroeker arrived, as I told you in an earlier post. Marilyn and I got busy with the creative details. Marilyn is an old scrapbooking friend, so we got out my stuff and made a birthday banner. Then we started on desserts. In between all the working, we hit the pool, ate some great food, and introduced her to our Bible Study friends. At our Wednesday cell meeting we celebrated Lalo and Carmen's birthdays (12 & 19 of July). It was nice to heave both Marilyn and Jaycia (my daughter-in-law) here, as they are both kind of perfectionists, detailed and creative. They worked really well together. The desserts and decorations were above par! one dessert table - desserts cut with a ruler! Our goal was to invite friends from all our groups: gym, neighbours, cell groups, etc. Our idea was to have a party with a purpose. 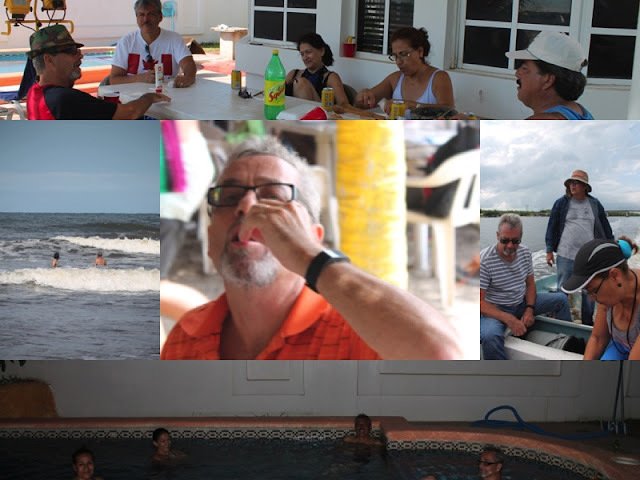 It was a table games day with everybody throwing 10 pesos in the middle for each game played. The money was to go to the day care where we help out. .... and the cherry on the top... fireworks to end the evening (thanks to our kids and my brother). Everyone said it was a great party, lots of fun. Together we raised 4000 pesos for the day care. We are blessed.